We are all confident that location independence is the future of work. We patted ourselves on the shoulders that we are amongst the first ones to realize this. Now we have to accept that with all the perks of pioneering comes a whole pot of responsibilities. Becoming a responsible digital nomad may not be easy – but it’s worthwhile. And necessary. The world needs you! As modern-day pioneers, we have the power not just to shape, but to entirely change the way the world works. And we will change the world. Now it is up to us whether this change will be positive or negative. If you bear with me for a few minutes, I will explain. Contents of Responsibilities of a Digital Nomad. How We Will Change The World. 9 Make A Difference Today! Whenever great changes took place throughout the history of planet Earth, it was always the pioneers who set the tone. Unfortunately, they often chose violence as their means of communication. That’s why native Americans, Aborigines, Mayas, Incas and countless others simply got beaten to pieces. What do you think this planet would look like if the Apaches had scalped the first settlers, and not the other way around? Pot pipes and weed would be accepted worldwide. Instead of electromagnetic WiFi radiation there’d be clouds of smoke everywhere. And the world’s most orthographically respected leader would be called ‘Orange Skin’. But that’s not how history went, and there’s no point in crying over smoked pipes. However, there’s a big point in caring about stuff in the pipeline. And in a world where location independence becomes more standard every single day, it isn’t hard to understand that the responsibilites of this ever-growing group are increasing by the minute as well. As frequent travelers, nobody can deny that we do have an impact on mother nature and the environment around us. Changing locations regularly often results in a ‘buy-and-throw’ mentality. Planes pollute our planet. Sourcing raw materials for laptops deplete limited natural resources. Digital nomads with their often minimalistic lifestyles are by far not the worst bunch of bananas. However, since every human being has a certain responsibility to keep this planet alive, location independent entrepreneurs are no exception here. How often do we order packaging-intense takeaway or delivery out of laziness or the feeling we need to rush and be productive? Do we really offset all carbon emissions for our flights? How often do we check the ingredients of products we buy and understand the impact they have on our planet? Some more, some less often. Which is perfectly fine, as long as we grow our environmental awareness along with our businesses. If we all grew the latter only, our planet is doomed a lot sooner than it needs to be. And if we all point at our neighbor to load responsibility off our shoulders, the doomsday scenario is exactly what awaits us. It hence is paramount to reflect regularly on how we can be more environmentally responsible nomads. In case you currently lack inspiration but are keen to challenge yourself to become more responsible, maybe try one of the world-changing Jallenges. They’re free, and you have nothing to lose. The easiest way out: Book your accommodation going forward with B’n’Tree. For every bed you book, one tree will be planted – at no cost to you. Take a look at B’n’Tree: You book a bed, we plant a tree. B’n’Tree is a great beginning. But it should by no means be the end of our environmental responsibilities. As open-minded world citizens, we have the power to shape economies. And most of us already do, by paying rent to local landlords in low-cost countries or outsourcing half our business to even lower-cost jurisdictions. Some people celebrate themselves for paying slave-wages to freelancers and evading tax altogether. Neither of the two is sensible nor sustainable. In the best case, our outsourcing helps a new middle-class in lower-cost countries emerge – and these people could well be our next customers in a couple of years. It’s nothing wrong with outsourcing or profiting from geo-arbitrage. Just please bear in mind that you are dealing with real human beings on the other end, so please treat them with the respect they deserve. But our economic responsibility doesn’t stop here. On the contrary, it goes far beyond that. We are facing economic questions every single day of our life, and it probably doesn’t hurt to think hard (and responsibly) about our answers. Do we want to support a Japanese multi-billion-dollar corporation, or do we pass the 7/11 and get our groceries at the local store? Is McDonald’s the best food we can find, or should we immerse ourselves in local cuisine? Is there a chance we can support a local community or charity with our globally sourced profits? Most location independent startups do not have bags of cash spare to share with strangers. I myself am not filthy rich, nor do I aim to be. And luckily, we don’t need to. Small changes can make a big difference. Just give the cash you already spend some thought, such as choosing your preferred grocery store more consciously. Since many of us are influencers, and often delight a followership of several thousand persons with blog posts and social media updates, it also is our responsibility to share our responsibilities with our fans and followers. Tell them you are offsetting your carbon emissions, share some local shopping and restaurant tips with them, motivate them to plant a tree, learn a new language or use less single-use plastic. Whichever approach you are into – make sure to use your influence for a greater good. As location independent entrepreneurs, we do enjoy the freedom to explore any corner of this planet. Despite mostly setting up camp in locations with fast and free WiFi, we often do end up in places that not too many others have explored before. As a result, we frequently get in touch with other cultures, that might not be familiar with our style of living, our language, our culture. 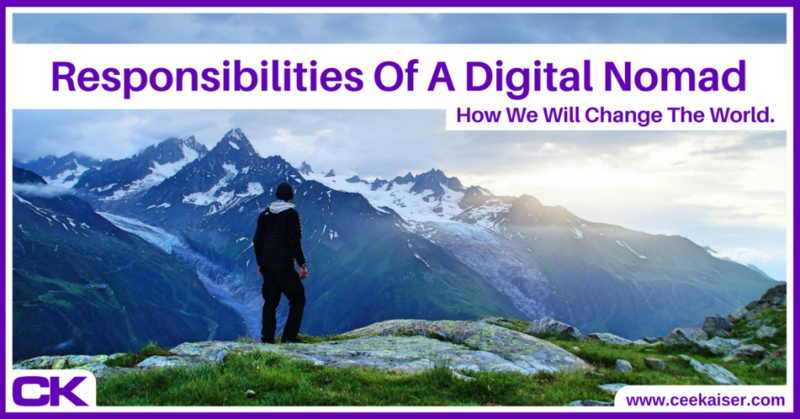 It is up to us to represent the global group of digital nomads in the very best way possible, to act respectful and responsible. The latest once we decide to settle in a certain place for a while, it never hurts to learn a couple of words in the local lingo and familiarize yourself with local customs. You don’t have to participate at every sacrificial ceremony, and you don’t have to support nor endorse whatever is happening. But you should understand and accept what is going on around you. You are the guest in their home. You should be grateful for having the privilege to be there. And you should adapt at least as much as minimum necessary to not offend anyone around you. You could also try to make a couple of local friends, join a local sports club or share your world traveler’s wisdom with those willing to learn. It’s never wrong to integrate with the community. Just don’t be like the US government and spread the blessing of Christianity and democracy everywhere you go without being asked to do so. Take a minute to imagine what the world could be like in ten, twenty and fitty years’ time, if all of us, and those who follow us, acted upon above responsibilities. Imagine we could tell our kids and grandkids that we were the pioneers of change towards a more accepting, more equal and more peaceful planet. And a healthier one on top of that. Imagine your satisfaction on your dying day, knowing that you spent the years you were given dedicated to a greater good. Before we have too many priests rock up to service today, I want to clarify one thing before anyone starts throwing rocks: I am no saint. And I don’t pretend to be. I don’t act perfectly responsible every minute of my life. I don’t always offset my carbon emissions, I do enjoy white hot chocolates at Starbucks, I appreciate a well-working, light-weight laptop with good battery life, and no local Thai shop I found so far sold 2-liter milk jars, so I usually buy my milk at red-green-orange. My aim is not to pretend I was a saint. My aim is to start a conversation and increase awareness, amongst digital nomads as much as amongst everyone we get in touch with. May this be our audience or the people in that place we call home. Talk about it. Tell people you are a responsible nomad. If you aren’t yet, tell them you are becoming one. We need to face our responsibilities and become clearer about what they are. I find it a lot easier to act more responsible the more I think about it. Hence the main aim of this article is to inspire a discussion. Hopefully all of us as well as all those around us can profit from it. I experienced that the more I engage with this topic, the more responsible I become. If we all worked together, lived more responsibly and used our influence to spread the word about it… We can change the world. And we will change the world. Starting today. You cannot go back and make a brand-new beginning. But you can start now and make a brand-new ending. Take five minutes to watch the video. Easily the best-spent five minutes of any day. Make a first step now! Share this article to increase awareness. With your family, your friends, your fans, your followers. It loads you with a little social pressure, which will help you make the right decisions. And it helps spread the word. In addition, please comment below how you cope with these responsibilities. Add anything I have forgotten to inspire fellow world citizens. For exchange with like-minded people, join our Facebook discussion. And please be honest. There is nothing wrong with not being perfect. Nobody is.